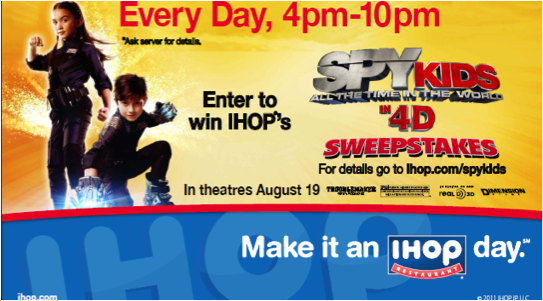 To promote Kids Eat Free, IHOP partnered with Spy Kids: All the Time in the World. Created kids activity booklet with back-to-school coupons. Hosted sweepstakes for a once-in-a-lifetime trip to Austin, TX to meet Director Robert Rodriguez and visit Troublemaker Studios and Schlitterbahn Water Park. IHOP received inclusion in online Spy Kids game.